William Joseph Potter, Jr. was born on September 24, 1935 and joined the Armed Forces while in Ambridge, Pennsylvania. He served as an aviator in the United States Air Force, and attained the rank of Lieutenant Colonel. On December 29, 1967, at the age of 32, William Joseph Potter, Jr. perished in the service of our country in Laos. The twin engine A26 Douglas Invader is the attack version of the venerable B26, which was one of the first aircraft to arrive in Vietnam with the 1st Air Commando Squadron in October 1961 as part of the "Farm Gate" detachment. Powered by two Pratt and Whitney radial engines with three-bladed reversible propellers, the A26 first began life during World War II with that original designation at times resurrected during Vietnam. It could carry eight forward-firing 12.7mm machine guns plus various combinations of bombs and rockets exceeding 10,000 pounds. While assigned to the South Vietnamese Air Force, the Invaders were flown by American aircrews. They repeatedly proved themselves as a valuable air asset against the Viet Cong throughout South Vietnam and Laos. On 29 December 1967, Captain Carlos Cruz, pilot; then-Captain William Potter, navigator; and Staff Sergeant Paul Foster, aerial gunner; comprised the crew of an A-26A Invader that departed Nakhon Phanom Airfield on an operational mission to interdict NVA activity in an area of Laos adjacent to the demilitarized zone (DMZ) separating North and South Vietnam. At 1358 hours, as the Invader made an attack pass on its target, it was struck by enemy ground fire and seen to crash on the east side of a mountain with a jungle covered valley continuing on to the east. This location also placed the crash site approximately 3 miles southeast of Ban Namm, 23 miles northwest of Muang Xepon, Savannakhet Province, Laos; as well as 25 miles west of the Lao/South Vietnamese border and 14 miles south of the DMZ. Within days before this flight, Premier Souvanna Phouma of Laos reported the incursion of North Vietnamese troops into his country. Further, he stated that the communists launched a general offensive against his Royal Lao forces in southern Laos. While the North Vietnamese denied fielding troops against the Lao, there was ample intelligence to refute their claims. Likewise, this area of eastern Laos was considered a major artery of the infamous Ho Chi Minh Trail. When North Vietnam began to increase its military strength in South Vietnam, NVA and Viet Cong troops again intruded on neutral Laos for sanctuary, as the Viet Minh had done during the war with the French some years before. This border road was used by the Communists to transport weapons, supplies and troops from North Vietnam into South Vietnam, and was frequently no more than a path cut through the jungle covered mountains. US forces used all assets available to them to stop this flow of men and supplies from moving south into the war zone. Carlos Cruz, William Potter and Paul Foster were among nearly 600 Americans who disappeared in Laos Many of these men were known to be alive on the ground. The Laotians admitted holding "tens of tens" of American Prisoners of War, but these men were never negotiated for either by direct negotiation between our countries or through the Paris Peace Accords which ended the War in Vietnam since Laos was not a party to that agreement. In early 1993, a joint American/Lao field team excavated the Invader's crash site. 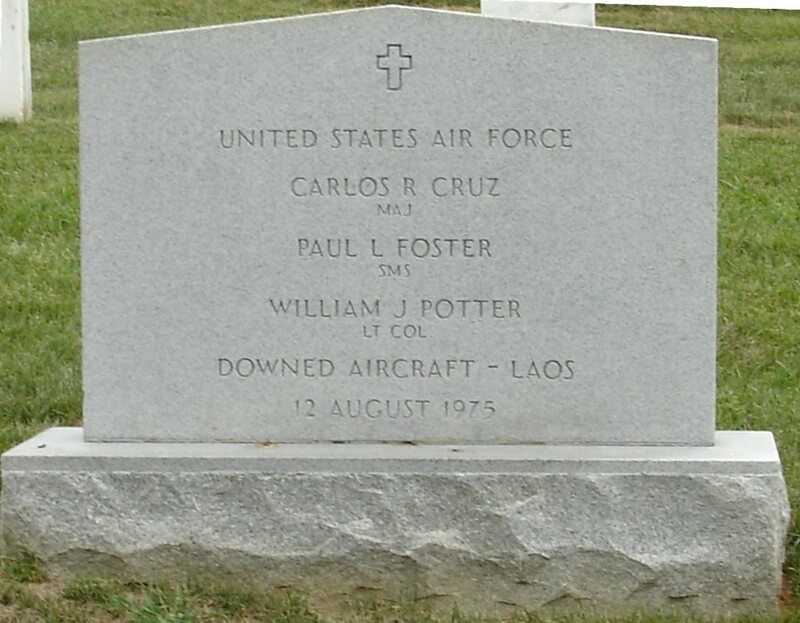 In addition to aircraft wreckage and personal affects, the team recovered bone fragments later identified as the mortal remains of Carlos Cruz, William Potter and Paul Foster. Lieutenant Colonel William Joseph Potter Jr., United States Air Force, was the co-pilot of an A-26A Invader which went missing over Laos on 29 December 1967. Born September 24, 1935 at Ambridge, Pennsylvania, Colonel Potter first served in the United States Army and was a member of the Honor Guard (the Old Guard) at the Tomb of the Unknowns. His remains, together with those of his crew members, Senior Master Sergeant Paul L. Foster and Major Carlos R. Cruz, were returned to the United States in August 1996. The crew was finally laid to rest on American soil at Arlington National Cemetery in December 1996 where he himself had watched guard over the unknown soldiers from prior wars.